Build – Build the journalism program at the mentee’s school through involvement in regular evaluation and scholastic journalism conferences and contests. The Journalism Education Association, a 501(c)(3) not-for-profit organization, can accept charitable giving to support the Mentoring Program. The JEA Mentoring Program has been in operation since the fall of 2007. So far, we’ve trained 70 mentors, who have worked with more than 475 new journalism teachers. 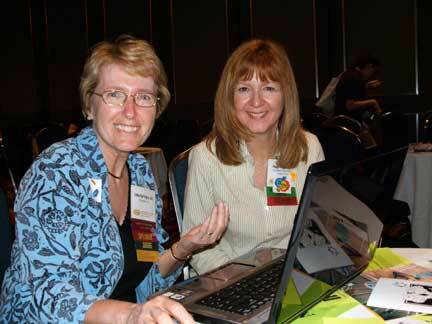 Linda Barrington (left) and Peggy Gregory edit materials at the JEA/NSPA convention in Anaheim that were distributed to the mentors. will stay with their publications and build them into strong, effective programs that promote JEA’s goals of freedom of expression, responsible journalism, and support for diversity. At the JEA/NSPA convention in Denver in April 2007, representatives of scholastic press associations discussed their concerns about the high turnover of new advisers and the impending retirement of many outstanding journalism educators. “We realized that the retired advisers had the expertise, the more flexible time schedule and the love of journalism to help make the mentoring program work,” explained Julie Dodd, who served as co-chair of the committee for six years. So, a key part of the program is identifying and training retired journalism teachers to serve as mentors. Dodd was one of the five JEA members (Linda Barrington, Nick Ferentinos, Peggy Gregory and Steve O’Donoghue) who developed the proposal for the mentoring program, which was approved and funded by the Board at their July 2007 meeting. 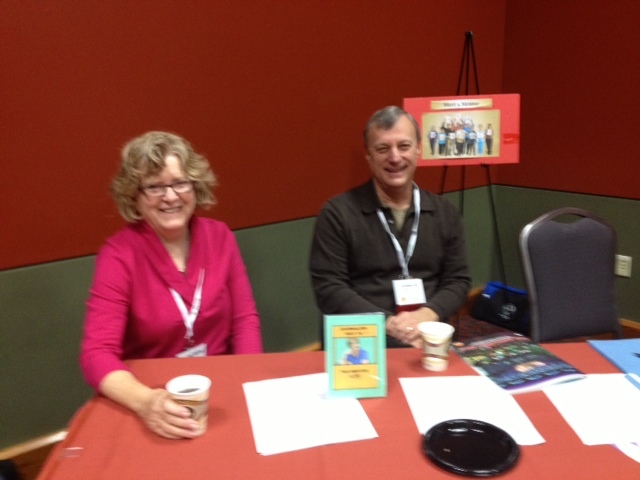 Mentor Committee members Mary Anne McCloud and Bill Flechtner at the Ask a Mentor Table at the JEA/NSPA convention in San Antonio. Mary Anne and Bill were members of the first cohort of trained mentors. Members of the JEA Mentoring Program along with then-executive director Linda Puntney attended the New Teacher Center Symposium to study one of the country’s most effective program in teacher induction. The JEA Mentoring Program is modeled on many best practices of the New Teacher Center. The funding provided by JEA enables the mentors to attend mentor training workshops at the JEA/NSPA national conventions.
. Participate in a training session held during the summer at the JEA Advisors Institute.
. Use the mentoring process that they will learn during the training, which is modeled on the New Teacher Center’s mentoring program.
. Make a two-year commitment to the program. 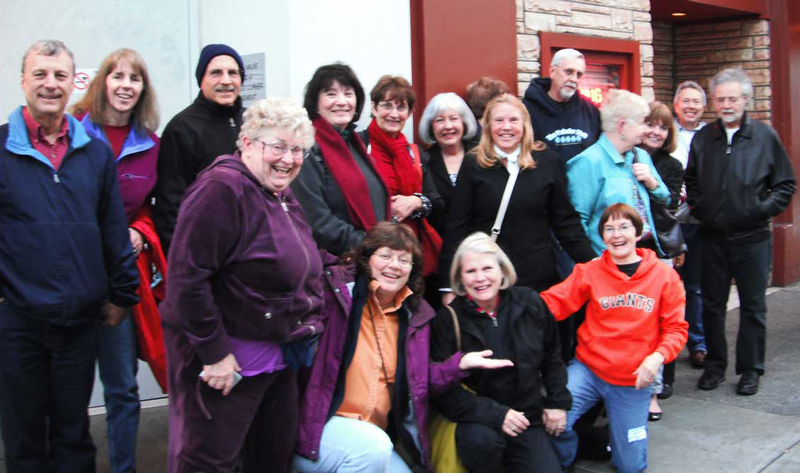 JEA mentors and members of the Mentor Committee posed for a photo outside Buca di Beppo, where they had dinner following training at the JEA/NSPA convention in San Francisco.
. Mentor at least two mentees the first year. By the second year, the mentor will take on more mentees. Many of the experienced mentors are working with four to six mentees.
. Collect data and prepare reports to establish the effectiveness of the program. That information is shared with the JEA board and with other funders of the program. The JEA mentoring program is fortunate to have the financial support of Yellow Chair Foundation and more than 20 other funders. The mentors’ support comes from both scholastic and professional press associations to provide stipends for mentors, registration fees for state conferences, free memberships, scholarships for mentees to new adviser workshops, etc.